Obama Cracks Down On Medical Marijuana Public support for the medical use of marijuana is rising, but the Obama administration has begun lashing out against the drug. The Justice Department has warned that dispensaries aren't immune from prosecution, even in states where medical use is legal. In many ways, things have been looking up for supporters of medical marijuana. Opinion polls now suggest that the American public is swinging behind the idea — and it's already legal in 16 states and the District of Columbia. But the Obama administration has been taking a very different view lately. Marijuana has been cropping up all over the country, becoming legal for medical use in places like Montana and Colorado, where the drug's so available that it became a target on Saturday Night Live this year. On that show's "Weekend Update," Seth Meyers drew laughs when he said, "A doctor in Colorado has converted two trailers into mobile doctors' offices to help dispense medical marijuana to patients in rural areas. Oh wait, you know, I'm sorry I read that wrong. Some guy in Colorado is selling weed out of a trailer. There you go." "It's a dangerous addictive substance and people are playing games with this and pretending because they think it's cool sometimes to not take it seriously," Walters said. First, on Monday, the White House released its National Drug Control Strategy, reporting that use of marijuana is the highest it's been in eight years. The policy document went out of its way to oppose marijuana legalization, arguing the drug is addictive and unsafe. Finally, the Justice Department has taken a tough line on marijuana too. Federal prosecutors say they won't go after sick people. But late last month, they warned that big medical marijuana shops aren't exempt from federal prosecution if they distribute the drug, even in states where medical marijuana is legal. "Unfortunately what the Obama administration seems to be doing is trying to scare precisely those state and local authorities who want to design sensible regulations to make sure all of this is properly under control," Nadelmann said. "You know a lot of this I think is about the Justice Department sort of firing a shot against the bow, and saying don't go too far." But distributing and selling marijuana remain crimes under federal law. 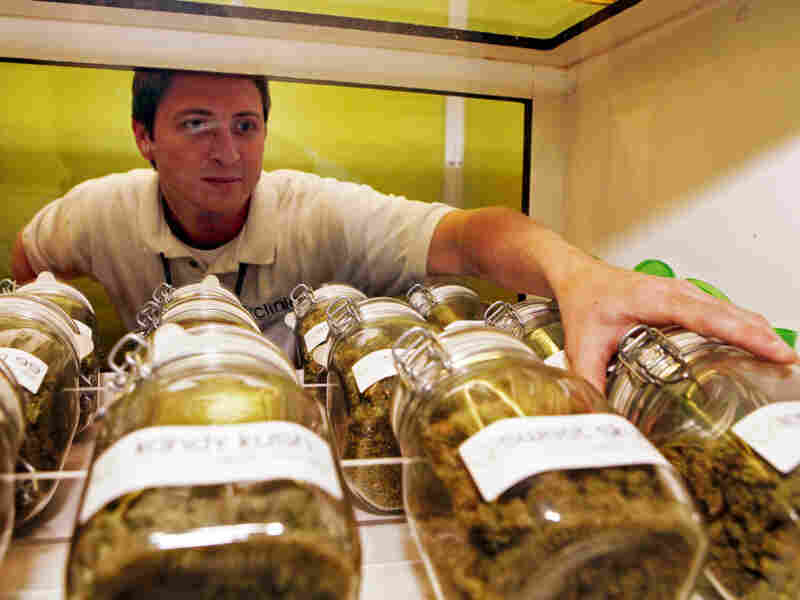 And U.S. prosecutors say they won't give growers and sellers a get-out-of-jail-free card. You know a lot of this I think is about the Justice Department sort of firing a shot against the bow, and saying don't go too far. In a June 30 memo, Deputy Attorney General Jim Cole wrote that over the past year, several states have considered legislation to "authorize multiple large scale, privately-operated industrial marijuana cultivation centers. ... Those who engage in transactions involving the proceeds of such activity may also be in violation of federal money laundering statutes and other federal financial laws." That's fine with John Walters, who worked on the issue for President Bush. "Many of these markets are making millions of dollars, they're not nonprofits as they've been declared in other places," Walters said. "They're getting the marijuana from some of the same criminal mafias in Mexico that are killing people daily." "The question's going to be what happens with the hundreds, and it may now even be in the thousands, of dispensaries that are not operating at that large scale," Nadelmann said.